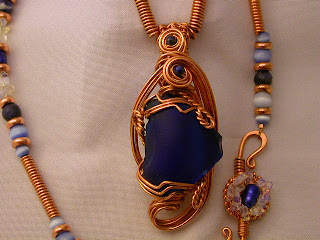 This is a pendant I made a few months ago and then made a necklace to hang it off of... Pendant "stone" is cobalt blue beach glass chunk, it looks like it may have been the bottom of an old Alkaseltzer bottle... but I liked the color and wrapped a copper setting for it with a little Lapis bead in one of the top swirls. 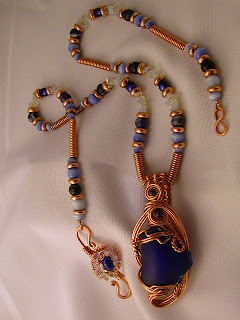 The necklace part is copper beads and coils, Cats eye laser optic beads, blue freshwater pearls, (dyed, but still beautiful) Sodalite beads and simulent "moonstone" chip beads. The S clasp has the " moonstone" chips, tiny copper beads and one big blue pearl. One of the frustrations I have with this style of wire work is that the pendant is very three dimensional and it never looks as good in a picture as it really is... that or I just take lousy pictures!